Maggot Barriers are made in the USA and all of the proceeds are used for fruit education and research. Adult female apple maggots are small fruit flies (about ¼ inch long) that lay their eggs just below the skin of apples. They can attack immature fruit starting in June or July and successive flights can continue laying eggs into the fall. The eggs hatch within a few days as larvae. What happens to the infected apple? While the larvae lack legs, they are prolific tunnelers and will proceed to lay tracks throughout the flesh of the apple. While in some cases you can see the tiny entry wound or the skin will reveal the presence of an infestation, often you won’t know until you cut the apple open after harvest! In most cases, the infected apple is useless. What non-chemical control measures are available? Over the years various ideas have been tried. One is to hang colored sticky traps (yellow sheets or red balls) in the trees with an attractant designed to lure the fly. These may be useful to monitor the presence of maggot flies but are usually ineffective in controlling apple damage. Other approaches involve protecting the apple with a physical barrier. One is to apply a kaolin clay covering but these require re-application (every week or 2) until harvest. Some folks have had luck with paper or plastic bags. Maggot Barriers to the rescue! 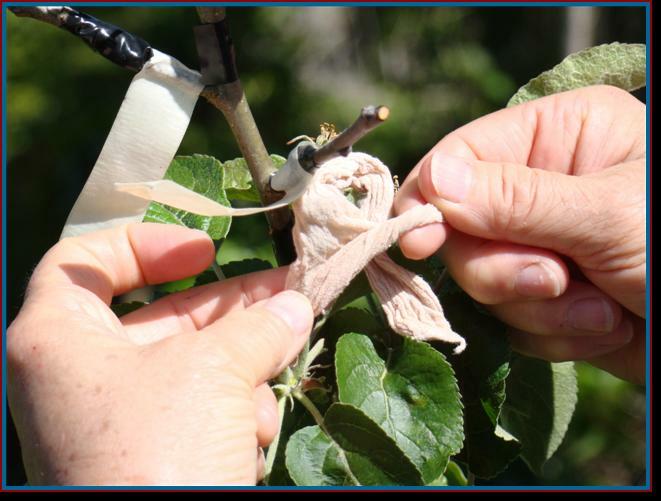 Several years ago Seattle Tree Fruit members started experimenting with small nylon sleeves that are applied when the apple is between a dime and a quarter in diameter. A good time to do this is when you thin the tree in May or early June. 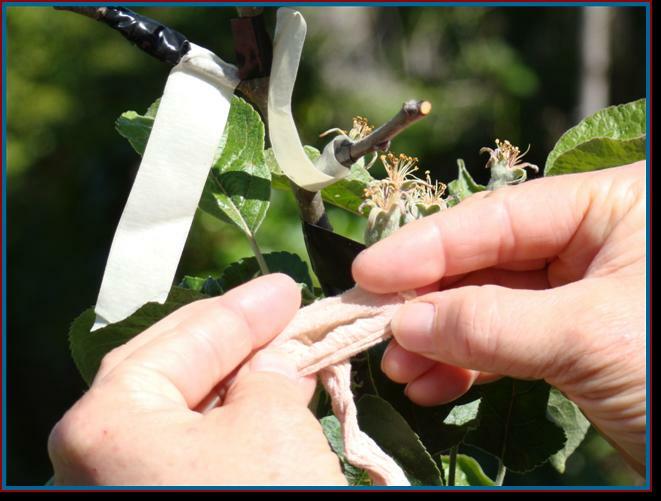 Once applied the nylon stretches as the apple matures and stays on the apple until harvest. 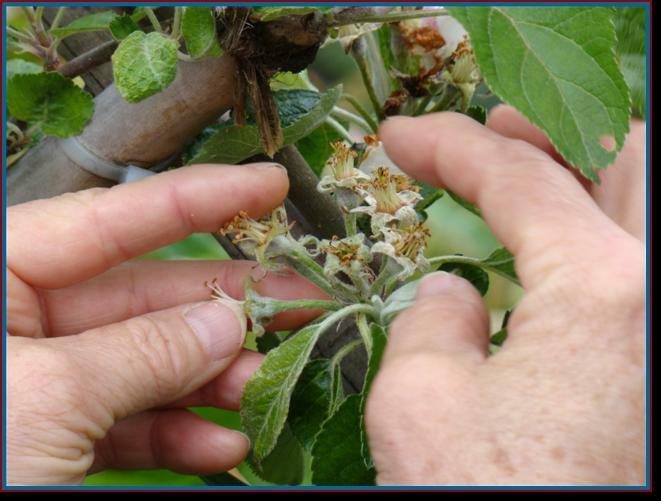 In our experience, the Barriers have proven effective in significantly limiting the damage from the apple maggot larvae. Instead of ordering Maggot Barriers, you could save paper and shipping costs by purchasing the Maggot Barriers at the Seattle Tree Fruit Society meetings. See Calendar for meeting times and dates. How to apply Maggot Barriers to your fruit. 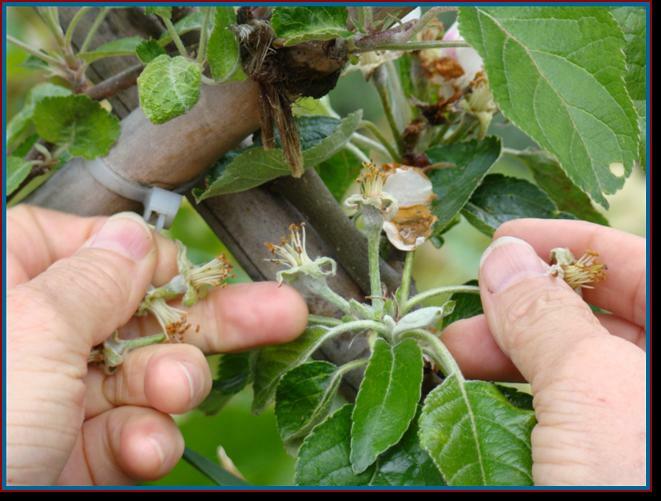 Here are two methods for applying the Maggot Barriers to your fruit. One is with tiny 3/8” Orthodontic rubber bands or similar rubber bands and the other way is without rubber bands. 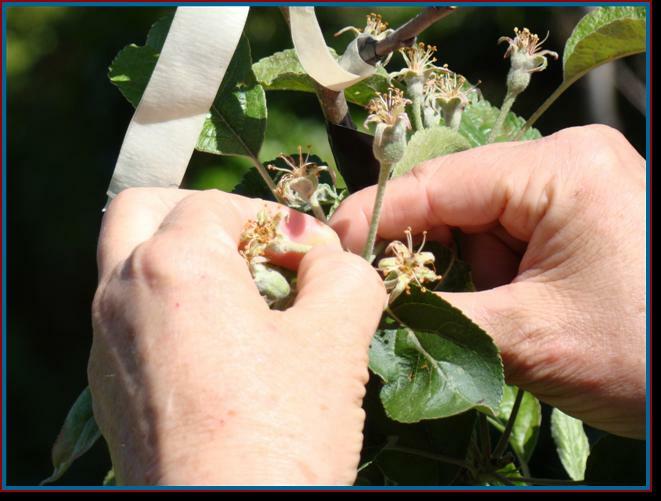 #1 – Thinning apples and applying Maggot Barriers with a Rubber Band. Find the one with the sturdiest stem and most developed fruit. Pinch out the smaller ones. Don’t leave any that are yellow . Keep the healthiest one. Slip the 3/8″ orthodontist rubber band onto the opening end of the Maggot Barrier. Spread the Maggot Barrier open along with the rubber band. Slip over the apple. Get the apple into the Maggot Barrier an inch or two not more. Lots of room to expand and grow. 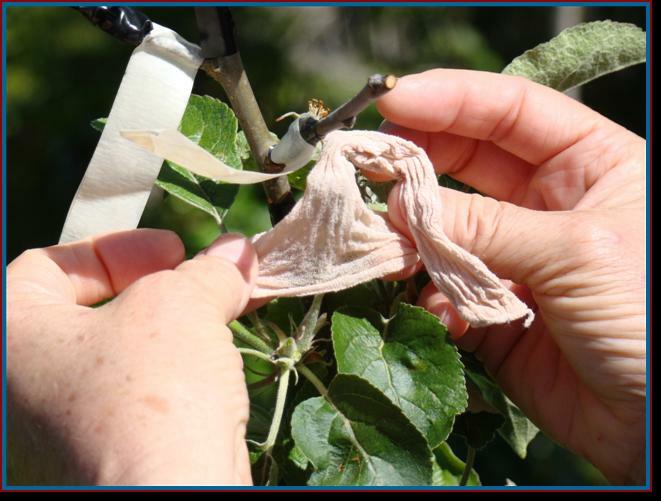 #2- Thinning apples and applying a Maggot Barrier without a Rubber Band. Best apple of the cluster. You can tell the best one. It has a thick stem and larger fruit size. Slide it over the apple. I only put if an inch or 2 into the Maggot Barrier. Hold the apple stem steady and pull the extra opening to the side and twist. Tuck the twisted length back inside the Maggot Barrier. Stick the end back up inside so it won’t slip out.